Rhee’s status as Chancellor has come to be the subject of much public speculation in the wake of Vincent Gray’s win of the Democratic Party nomination for mayor on Tuesday. 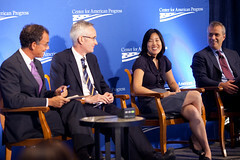 TBD today speculates on who might take her place atop DCPS if Gray decides that Michelle Rhee cannot serve his new administration, and questions have abounded to Gray, as well, with Mark Plotkin finding new and unique methods of asking the same question over and over and over today to Gray on his radio show. Gray has publicly said he won’t make any decisions until he was properly elected and not just nominated. Why is Rhee making this about her? I thought it was about the kids; if so, why doesn’t she accept the election results and try to figure out a way for her and Gray to work together for a common purpose. Why does she seem to think that her way is the only way to reform DC schools? Between Gray and Rhee someone needs to be a grown up and make an effort to work together; but realistically I think Gray will replace Rhee. During his time on Plotkin’s show today, Gray did say that they were talking, Zesty. I concur with others that say there’s no way in hell Rhee stays on in this position – Gray’s supporters who want her head didn’t back Gray just to have her keep that job. Were he to fail to throw them some red meat he’d be in a bad situation politically. Perhaps there will be some consultancy position for Rhee. Her teacher evaluation system isn’t really the problem – it’s her implementation and (complete lack of) finesse. Gray might have success with putting someone else in the visible gig and letting Rhee provide direction that the actual chancellor could opt to take or not. I like the articles you write; keep up the good work! I was referring to them working together not just communicating. E.g., Dems and Repubs are talking all the time but they are certainly not working together (at least as much as we would like). @Don, I like your idea of putting Rhee in the background but I don’t think Rhee would accept such a position.